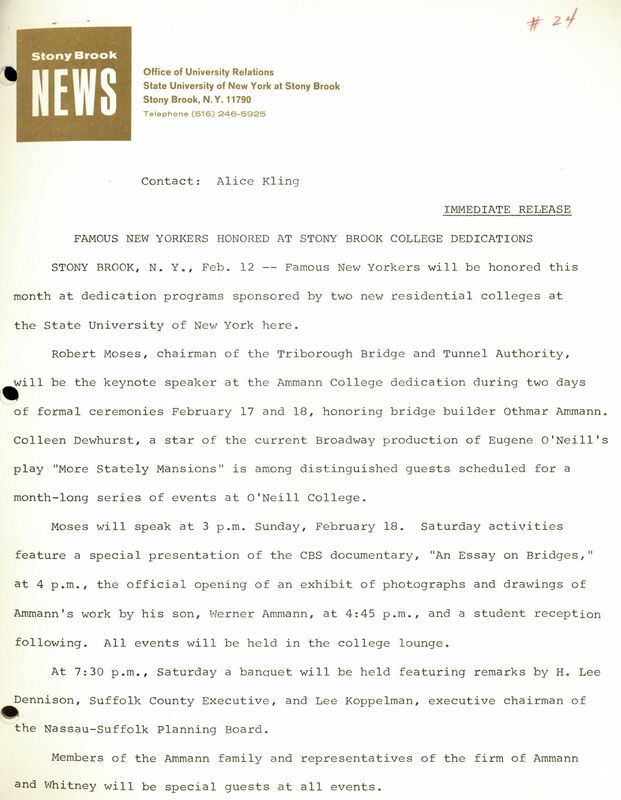 SBU press release announcing the dedication of Ammann and O’Neill Colleges (dormitories), February 1968. In the 1960s and 1970s, Stony Brook University was in the midst of rapid expansion from building construction and recruitment of top faculty to hosting athletic events and countless art and music programs for the university and neighboring communities. 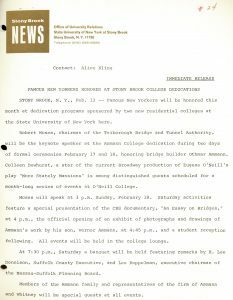 Important and daily activities on campus between 1963 and 1978 can now be traced by consulting the SBU press release archive, part of the University Archives. For example, 50 years ago in February 1968 the dormitories Ammann College and O’Neill College were dedicated over the course of two days. The buildings were named in honor of Othmar Ammann, the engineer whose credits include designing the George Washington Bridge, and famed playwright Eugene O’Neill. The keynote speaker was Robert Moses, the “master builder” of mid-20th century New York City, Long Island, Rockland County, and Westchester County. For more information about university history visit the website of Special Collections and University Archives.